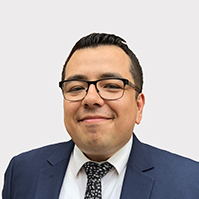 Daniel Rodríguez joined Mullen & Filippi as an Associate Attorney in 2018. He represents employers, insurance carriers, and third party administrators in workers’ compensation claims and related matters. Prior to joining the firm, Daniel served as a Deputy District Attorney. Daniel received his law degree from the University of San Francisco School of Law in 2015. During law school, Daniel served as a tutor in Civil Procedure and as Vice President of the La Raza Law Students Association. He earned his Bachelor’s Degree in History from University of California, Santa Cruz in 2009. Daniel is currently a member of the State Bar of California. I love being an attorney. I get paid to read, write, think, talk and argue—these are things I would do anyway. One of my passions is cooking. I am fascinated by how food brings people of all walks of life together.